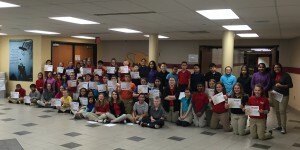 Last Friday, students at Southport 6th Grade Academy were honored for their success. Students who had perfect attendance for the first semester and students who received all “A’s” for the 2nd grading period celebrated with ice cream from Dairy Queen and were presented with “Paw Awards”. Congratulations on a job well done!!! !